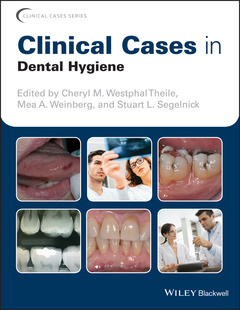 Coordonnateurs : Westphal Theile Cheryl M., Weinberg Mea A., Segelnick Stuart L.
Clinical Cases in Dental Hygiene is an indispensable resource to understanding both the theory and practice of dental hygiene, illustrated by real-life cases in a clinically relevant format. Cheryl M. Westphal Theile, EdD, RDH, is a Clinical Professor, Associate Dean for Allied Dental Programs, and Director of Dental Hygiene at New York University College of Dentistry in New York, NY, USA. Mea A. Weinberg, DMD, MSD, RPh, is a Diplomate, American Board of Periodontology and a Clinical Professor of Periodontology and Implant Dentistry at the New York University College of Dentistry in New York, NY, USA. Stuart L. Segelnick, DDS, MS, is in private practice in Brooklyn, NY, USA. He is a Diplomate, American Board of Periodontology; Diplomate, International Congress of Oral Implantologists and is an Adjunct Clinical Professor of Periodontology and Implant Dentistry at the New York University College of Dentistry in New York, NY, USA.